This article was first printed in The Allston-Brighton TAB on September 23, 2011 and online on October 4, 2011. The plant first appeared in Massachusetts in the late 19th century when it escaped from a Cambridge garden. In recent years, it has staged a hostile take over of the state’s parks, yards, meadows, and woodlands. This year, many towns have begun to take aggressive action to control it. Boston — There’s a new creep in town. It has been weaving itself through fences and hedges in Allston-Brighton all summer long, plaguing homeowners, gardeners, and landscaper. It goes by the name black swallow-wort. In many areas of Massachusetts, black swallow-wort threatens the local ecosystem. By sending out runners, or long underground stems, the vine is able to spread over large areas and can quickly overtake a yard or meadow. It produces a crop of green pods that, when mature, turn brown and burst open to release several little brown seeds with white tufts of fuzz that catch the breeze, spreading the plant over long distances. In areas with intact ecosystems, the infestation can be a real problem, upsetting the balance of plants, insects, and even birds. This summer, in Cambridge, there has been an active campaign to eradicate the plant. Resident volunteers of the “Pod Patrol” scour the city collecting bright green seedpods to either burn or dispose of in a landfill. In Belmont, the Massachusetts Audubon Society’s Habitat Wildlife Sanctuary acquired a meadow completely overrun with black swallow-wort and other invasive plants. The sanctuary attempted to eradicate the weeds by bringing in hungry sheep and goats. Unfortunately, even the animals found the plant distasteful. 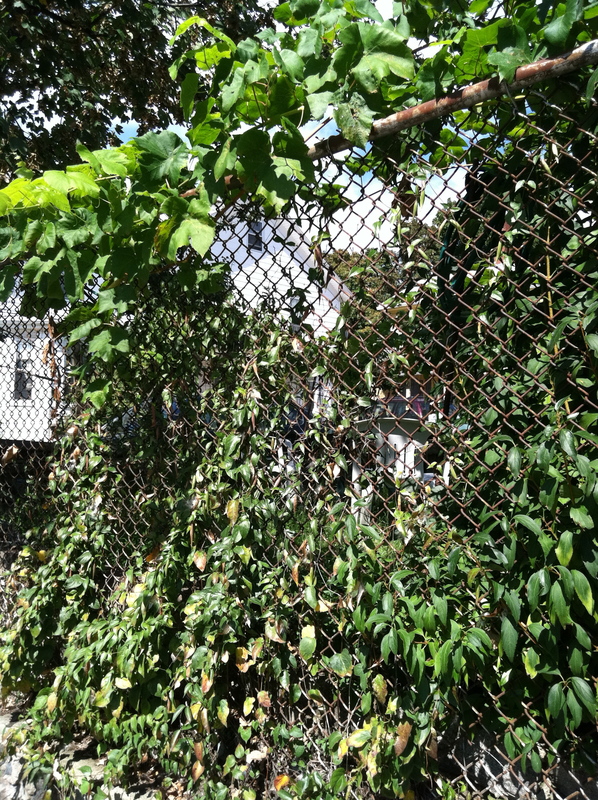 In Allston-Brighton the plant poses more of an aesthetic concern than an ecological threat. “I’m not sure that you can say that there are any native ecosystems in Allston. I wouldn’t know where to look for them,” says Peter Del Tredici, senior research scientist at the Arnold Arboretum and an expert on wild, urban plants. For Allston-Brighton, perspectives of the plant as a problem varies widely. “We’re not talking displacing native species here, we’re talking about chain link fences,” Del Tredici says. But he doesn’t hesitate to add that he hates black swallow-wort and aggressively tears it up in his own yard. The best time to pull it is in the spring, he explains. Once it becomes established, it can be difficult to remove. Yanking mature vines does little to affect the overall plant. Individual limbs easily break off the runner, which responds by producing more shoots. Removing the plant this time of year requires some exploratory digging with a trowel or shovel to uncover the entire root system. Not everyone is interested in evicting the black swallow-wort, though. “I think it’s kind of pretty,” says Melissa Copeland. The vine has woven a tapestry all over a chain link fence in the backyard of her ranch-style duplex in Brighton’s Aberdeen neighborhood. She says she originally left the vine alone because she thought it could be poisonous and induce a rash, but has since grown to like it.